There really isn't anything better than waffles for dessert, I mean they're savoury AND sweet. Waffle Gone Wild has been around for a while but I only recently got the chance to visit (and thank goodness I did). This place is super cozy and seats 10 people at most. If you've been to Nero's Belgium Waffles in downtown, you'll find that Waffle Gone Wild has a similar layout. It is however, much "cuter" here as there are collages of pictures and other decorations around the store. Unlike Nero's, you can sit down at a table before ordering if you're planning to dine in. 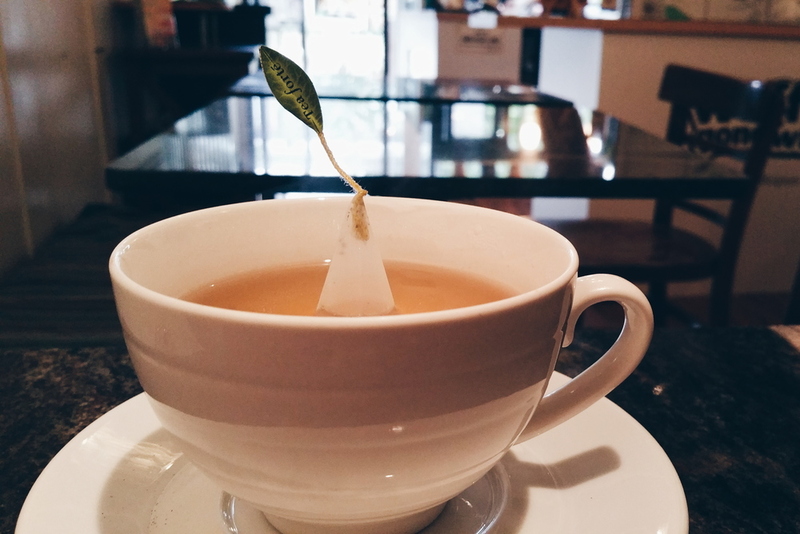 N/A - It's loose leaf tea, you can't do wrong - but hey tea tea bags are shaped like pyramids and have a leaf sticking out of them! 2.5/5 - This drink is almost too bland for my taste. There's no strong milky milk tea flavour and there's only a very mild taste of matcha. So basically, it's a watered down matcha milk tea. 5/5 - Ohmygoodness, this waffle is like a Japadog in waffle form and it's SO BOMB. The layer of seaweed under the bonito flakes is perfect with the sauce and mayo on top of the slightly sweet and chewy liege waffle. This is served hot/warm and could pass for my type of comfort food. I'm not a fan of savoury waffles but this combination of sweet and savoury is so perfect and I would have had another serving in a heartbeat. 4.75/5 - As if just a liege waffle wasn't enough already, this one is also filled in the middle with strawberries (how cool is that). This waffle is piled with the freshness of strawberry and complimented with chocolate drizzle and whipped cream on the side. This would've gotten a 5/5 if not for the pudding still being a bit frozen. Waffle Gone Wild is a super cute waffle cafe and definitely worth going to for the chewy liege waffles topped with interesting ingredients. The staff here are friendly and chill which makes for a comfortable environment. The decor adds to the cute and playful ambiance of the area and I'm definitely not complaining. If Waffle Gone Wild was located closer to where I live or places I usually go to, I would definitely visit more often.